I hadn't ever considered that skydiving in virtual reality was something people do until two weeks ago. To be honest, I've never seriously thought about skydiving full stop. I mean, sure, it's cool to watch gnarly types pull mid-air manoeuvres on your Facebook feed, but jumping out of an aeroplane is something I've never felt compelled to try. Still, when I saw the chance to take the plane element out of the equation through the power of a Samsung Gear VR and a vertical wind tunnel, I was intrigued. I'd be able to experience the free-falling sensation and breathtaking views while floating artificially. I was eager to find out more about the project first. Specifically just how accessible this was for someone who has never considered taking the leap before. The experience is live thanks to the folks at VR tech company Tunnel Vision, who collaborated with Twinwoods Adventure activity centre to integrate the Gear VR into a standard skydiving helmet. Tunnel Vision co-founder Cody Russell told me the idea was born from unwilling real-life participants — people like me. "I started skydiving and it completely changed my life; I was always trying to get people to come and experience it," he said. But people would say, 'Oh, it's too dangerous,' or 'I want to do it but I don't want to die,' just every excuse you could possibly think of. And it dawned on me — why don't we bring virtual reality to skydiving in the wind tunnel? That way, the masses can do it. VR is on the rise, and so are wind tunnels, so it just kind of made sense to bring the two together. There's no age limit on it, it's super safe, there's no excuse any more." Before I launched myself into the howling tunnel, I was given the opportunity to practice the basic skydiving technique. You know the one: invert your spine, keep your chin high and lock your arms into a David Brent-style dance position. That was relatively straightforward once I grasped how subtle changes in body position directed you around the turbine. I also didn't land back on the platform feeling nauseous, something which Russell noted wouldn't be a problem once in the rig. "We've had zero issues with motion sickness, because that's where the software kicks in," he told me. "There's no streaming of the experience, so there's no lag. You turn your head and it's right there with you. We've had people who have never gone skydiving, their first time is with the headset and they flew perfectly. There's no real learning curve here — we took as many steps out of educating users as we could." Explained: How does VR actually work? Even then, and after completing four trial runs without the headset, I was sceptical of how immersive the experience could be. 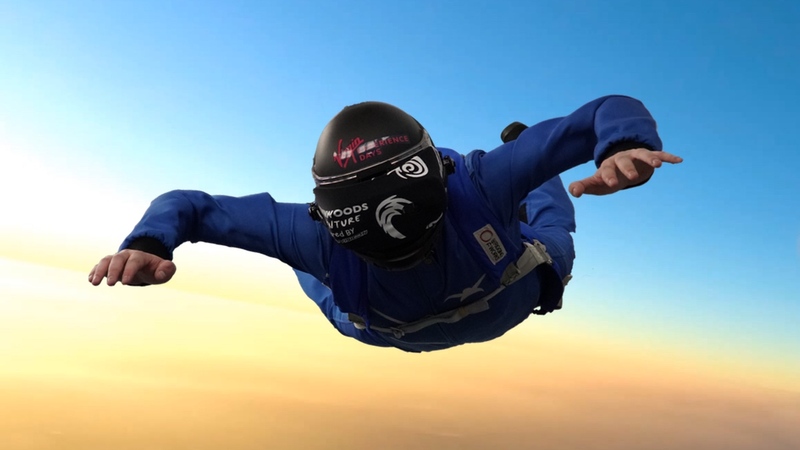 Before zipping the blue jumpsuit back up and diving in with the tech, I asked Sergeant Dean Walton, part of the Red Devils, the British Army's Parachute Regiment display team, how he found the VR experience. "We do a lot of displays, a lot of jumping throughout the year and the VR is as close as you can get to the real thing, it's excellent. There's no lag on the movement, the skydiving helmet is a genuine one that you can use with or without the technology, so that fits really well. "The only way you can get any closer is if you jump out of an airplane. And the applications for it in the future are really strong; there's so much potential there for training when the technology improves even further," he told us. And while he admitted there's nothing like the real thing, Russell noted how the tech could help propel those currently sitting on the fence to the door of a plane, as well as open up the action to those who don't live in places where more exotic jumps are accessible. So, after running through some wind tunnel basics, I was ready for the (kind of) real thing. Firstly, I was given a Gear VR to hold over my head while a fabric sheet helped lock this into place. On screen, I was given a test screen in order to calibrate the display, something which remained until I was led to the door of the tunnel. As I felt the wind in front of me, a video sequence of the Tunnel Vision team in an aeroplane preparing to jump begins playing. I looked to the right to see a fellow jumper counting down, before giving the real-life instructor the thumbs up to jump into the turbine. You're told not to move your head up and down too much, since this can throw your balance off, but in the quick glimpses down I was hit with a panoramic view of the edges of San Diego and the rest of the divers spinning around beneath me. It's unlike anything I've ever experienced in VR, since the wind below you adds something completely fresh. It gave me the same level of jaw-drop as strapping on a VR headset and looking around for the first time, or when I first lifted handheld controllers like Oculus Touch up to the screen and saw my virtual hands mimic my actual movements. I wasn't focused on how close I might be to the wall, or even really taking in the instructor pulling my legs into the right position. And while it was a truly awesome experience to fly around the artificial San Diego skyline with wind blowing in my face, it's also easy to cast your mind forward and think about how far applications like this can replicate real-life ventures. With this year seemingly set to mark the point when untethered, higher resolution VR headsets become accessible, there's certainly room to grow regarding how realistic the video appears on-screen. In terms of head tracking smarts and immersion, the mission to bring skydiving to VR in a 4D environment ticks the initial boxes and later this year, skydiving experiences set in Dubai, jumping over the Grand Canyon and flying with the Red Devils will be available to choose from. After all, if only for a few minutes, I was able to leave behind a wind tunnel in Bedford and glide around the Californian sky with people I'd only just met. And at the end of the day, isn't that what VR is all about? VR4D Skydive costs £85 per session as a Virgin Experience Days exclusive at Twinwoods Adventure, Bedford.